Two new magnificently designed variations of the Gibraltar Silver Royal, a legal tender coin with a face value of £15 containing one troy ounce of pure fine silver with a millesimal fineness of 999 (99.9%) are now available. 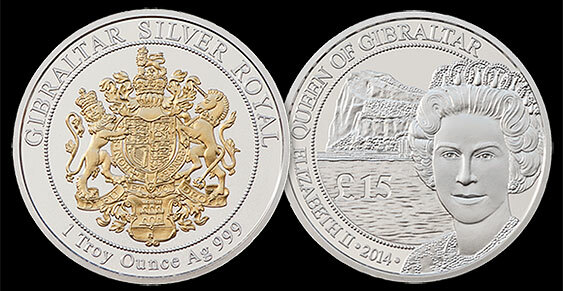 The Gibraltar Silver Royal is engraved on the obverse with a timeless effigy of Her Majesty Queen Elizabeth II, together with the image of the Rock of Gibraltar in the background and the inscription “Queen of Gibraltar”. The reverse of the Gibraltar Silver Royal depicts the Coat of Arms of Gibraltar. The Coat of Arms is 24 carat gold plated to emphasize the intricate details of the design. The Coat of Arms on the GIBRALTAR SILVER ROYAL’s reverse is enhanced in 24-carat gold that subtly highlights the complexities of the design. The British lion is completely in gold, while selective gilding of the unicorn accentuates its mane and, especially, its horn. Attention is called to the motto “Dieu et mon droit”—God and my right. The gilding of the Gibraltar Coat of Arms is exceptionally effective. It embellishes the castle with its distinctive three towers and forms a ground against which the chain and key are clearly visible. The coins are priced at £42.50 each and are sold inside a presentation case with original an certificate of authenticity.